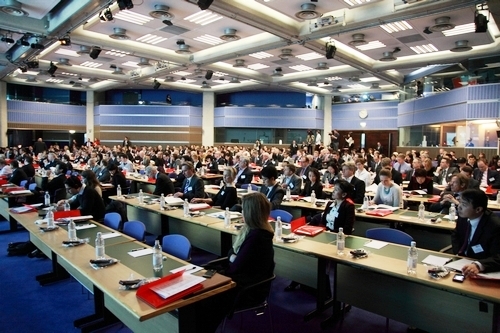 On March 14th, China-Britain Business Council held the “China Business Conference 2013” in the Queen Elizabeth II Conference Centre. More than 300 representatives from the political, business and academic circles of China and UK attended the meeting. 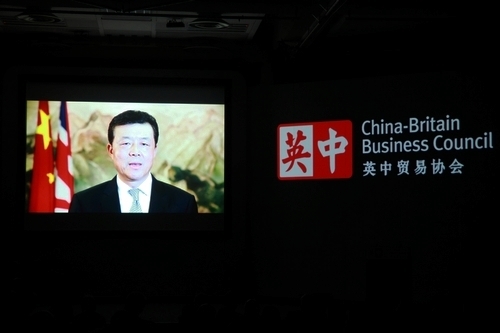 Ambassador Liu Xiaoming sent a video message to the conference. He said, “The messages sent out from the 18th CPC Congress and the current NPC and CPPCC sessions clearly show that China has identified its future direction. These messages include the following elements: shift the economic growth model to boost productivity; speed up urbanisation to generate new demands of investment and consumption; raise incomes and improve social welfare so that people can spend more; strengthen education and training to create a new ‘demographic dividend’; deepen the ‘reform and opening up’ as policy guarantee to further unleash the potential of the economy. With the above-mentioned driving forces in place, the Chinese economy will continue to grow steadily for another three decades. In turn China will be able to overcome the middle income trap and achieve the two major goals laid down at the 18th Party Congress: one is to build China into a well-off society by 2020, and the other is to build China into a modernised country that is rich, strong, beautiful, democratic, culturally advanced and harmonious by the middle of this century. Ambassador Liu stressed that he believed sustained economic growth of China was really excellent news for British companies: “you will see a larger export market and a more rewarding investment destination. Your technologies and IPRs will be better protected and generate more returns. You will see more tourists from China, and they will create more jobs and business opportunities for British tourist and retailing sectors. You will see more Chinese state-owned and private enterprises make investments, open branches and set up regional headquarters in Britain. You will see expanding off-shore RMB business in Britain.” He then called on Chinese and British business communities to seize these opportunities and work together for win-win. British Prime Minister David Cameron also sent a video message to the conference. He said that strengthening UK-China trade and business ties would offer a tremendous opportunity for the two countries. China plays a very important role in the prosperity of the UK, because there is a great demand for our quality products from China with rapid economic growth and a growing middle class. The British Government will try its best to deepen economic and trade cooperation with China by taking a series of effective measures. British Prime Minister Cameron said that the British government is committed to further promote Sino-British relations, and welcomes Chinese investment with open arms, and will give British companies strong support for their cooperative projects with China. Other people including Mr. Ken Clarke, British Minister without Portfolio, and Mr. Hugo Swire, British Minister of State at the Foreign & Commonwealth Office, addressed the conference and said that there are good opportunities and great potential for China-UK economic and trade cooperation. Through consultations, the two governments have reached a favorable agreement on the relaxation of controls over foreign market entry and a stronger protection of the IPRs, etc. To strengthen China-UK economic and trade cooperation benefits us all. The British government will spare no effort to promote further development of our bilateral economic and trade relations.